We are innately attracted to promises of solutions to problems, not to examining the underlying problems. In the wild, that is the healthiest approach because problems there share wilderness simplicity, and the solutions are straightforward. It was natural for us to evolve the inclination to opt for the simplest view of most any problem, and then go all out for the solution. 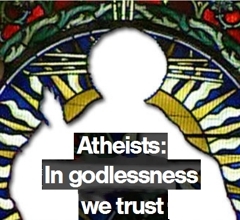 This short CBS video, Atheists in godlessness we trust, captures the essence of this approach. The problems civilization brings about are multifaceted; solutions are not straightforward or obvious. Many of these problems arise out of the social dysfunction that civilization induces. Being a tribal animal we quickly jump to an ‘us vs. them’ or a ‘right vs. wrong’, view of things. We take sides, and focus on apparent solutions. This usually comes down to changing ‘them’ or righting the ‘wrong’. Now, don’t get me wrong. I don’t wish to abolish civilization! However, I do find it useful to know just how discordant civilization is with how we evolved biologically. We have not evolved the innate means of coping with civilization effectively… and naturally so! Civilization is actually a very recent culturally learned innovation without a stable grounding in instinct. Historically, religion and civilization have arisen in parallel. Now ask yourself, did these arise hand in hand by coincidence? From a symptoms point of view, it appears obvious that the world’s current religions arose as an attempt to ‘right the wrongs’ that civilization provokes. We are approaching problems no different from how we would if we were still living in the wild. We see the problem at face value and go all out for the ‘obvious’ solution. The thing is, until we know the underlying problem, we can’t really find the effective solution. No wonder history repeats itself! After watching this 60 Minutes piece on Saran gas, I woke up in the middle of the night pondering it. Like Nazi Germany, none of this would be possible if not for those involved being under the delusion of their story (1). Granted, these are extreme examples, but no different in character from what happens to each of us since humanity evolved the ability to make up stories. The disease of thinking that we know, as chapter 71 puts it, permits our stories to go uncontested. Naturally, the problem is not actually the story, per se; it is believing that the story is true! When the story becomes our reality, we disconnect from reality. Why do we hold on so tightly to our story? Buddha’s 2nd Noble Truth hints at it: “The illusion of self originates and manifests itself in a cleaving to things.” However, fear causes the original “cleaving”. Our story gives us something tangible to know and hold. We are desperate to know that we know. Uncertainty drives us crazy with worry. (See Fear & Need Born in Nothing). Upon examination, it should become clear that our belief in word reality is the real culprit. The stories we compose depend on our unquestioning false faith in the words we use to think about and interpret our life’s experiences. Chapter 1 of the Tao Te Ching begins by addressing this head on. Words are not reliable indicators of reality. For instance, as soon as a word triggers emotion, we unwittingly (neurologically) skew meaning to reflect our own needs and fears. The reality we see in words is ourselves. This ‘mirroring’ can help self-understanding when we realize this is what is happening. The tricky part here is actually realizing this at the intuitive gut level. Essentially, it takes work to wean ourselves from our faith in word reality. After all, we grow up indoctrinated from birth into believing — trusting — word meaning. Isaiah 40:8 exemplifies this faith in word reality: “The grass withers, the flower fades, But the word of our God stands forever”. Throughout life, we just debate the stories that ensue, and never question the building blocks used to make the stories in the first place. The correlations process (see Using Yin and Yang to Pop Preconceptions) is a tool that can help reduce the blind faith we hold in word meaning. The only hitch is that the correlation process and chapter 1, when successful, don’t do anything to reinforce our story — just the opposite — and so it threatens any fondly held worldviews. In addition, social instinct impels us to have our story confirmed and reinforced by other people. This also leads us to judging anyone not like-minded as being foolish, ignorant, heretical, or just plain evil. The valley’s spirit never dies; this is called the profound female. Of the profound female entrance; this is called the origin of the universe. How will you know you are ‘getting it’? A visceral understanding of the first two lines of chapter 1, or of correlations, only comes about through rigorous self-honesty. Feeling of personal loss will inevitably play a role, for you will be piercing your ego’s protective shield of self-rationalization. Cleaving to word meaning and the stories it tells helps give rise to the illusion of self, and then to help maintain it throughout life (see Buddha’s 2nd Noble Truth). Naturally, the ego puts up a formidable fight, for it is holding on for dear life. Exactly what feels threatened depends upon what double standards you are hanging onto. Personally speaking, the correlation process truly helped liberate me from the imprisoning nature of word meaning. I don’t really know for whom, if any, this correlation process can work, but I feel obliged to put it out there just in case. In any case, I imagine the inner need to be self-honest at all costs is the most essential element — period! In hindsight, I believe the correlating process began upon hearing of my brother’s death in the early sixty’s. It was the first time I’d experienced death personally. I just couldn’t fathom death and its relationship to life. It really puzzled me, I knew the word death, but it didn’t feel ‘true’ I guess. After a few months of intense pondering and wrestling with word meaning, I realized that life and death were two sides of the same coin (2). Essentially, that experience pulled me until I viscerally knew, The way possible to think, runs counter to the constant way. The name possible to express runs counter to the constant name. That seems to indicate how one needs an overwhelming incentive to maintain enough follow-though to break through the ‘language barrier’. Chapter 56’s, Knower not speak; speaker not know challenges and contradicts anything I say here. Clearly, I rely on standard word meaning all the time — speaking, thinking, or writing this would be impossible otherwise. It is just that I know the words are fictitious. I think of words and names as the tricks in a magic show. I can enjoy the show without believing that the tricks are reality. Viscerally making that small step is all that’s needed to pierce much of the illusion. Be like the child who kind of believes in Santa Claus, but also begins to suspect that there is no Santa Claus. Indeed, kids make believe all the time, but they know deep down that it is only make-believe. When we reach adulthood, we don’t often approach life that way, especially in how we regard word meaning: we accept those symbols blindly; they feel real. We desperately need them to feel ‘a reality’ in order to help relieve the uncertainly and soften the mystery. After all, once we reach adulthood, we have no Mama or Papa to shore us up psychologically. I see religion as a symptom of the human condition, not the cure it promises to be. The exponential rise in social fragmentation following the agricultural revolution (10,000 BCE) left people feeling more and more disconnected. Religion offers an idealized story that connects people to the degree that they share a belief in the story. The inherent fragile nature of this connection drives people to push strongly to have others agree… and burn any non-believers at the stake. Fear is the driving force, along with the loneliness that comes with civilization. (1) How can an educated civilized nation of people murder 6 million people? Our attachment to the story makes it the controller of our actions, our will acts in service of the story. We are prisoners of our own story. Is outside his life, yet lives life. Of death, follow three in ten. Of people, aroused by life, in death trapped, also three in ten. Why is this so? Because they favor life. That is why they take death lightly. Only the man without use for life is worthy of a noble life. Ah, but it is easy if one’s expectations take the ‘lower position‘. The story we buy into determines the outcome we expect. Be careful what you wish for, as they say. My recent post, Science Proves Buddha Right! puts the teeth of science into this. As far as I can see, the difficulty we experience originates from the sales pitch of various spiritual Illuminati. On the other hand, perhaps these Illuminati are “ancients adept in the way” as in, Of ancients adept in the way, none ever use it to enlighten people, They will use it in order to fool them. We buy into their story because it offers us the escape we yearn for. Do they offer it out of a desire (1) to help us, or ???? Either way, our expectations rise in anticipation of their solution to our problem. And, our rising expectations place their solution out of reach. Kind of ironic, don’t you think? C’est la vie.